The BBC reports that a 62 mile long standstill on a motorway just north-west of Beijing has entered its tenth day. Motorists on the road between Jining and Huai’an, including hundreds of trucks from the coal fields of Inner Mongolia, have spent the week playing chess and being fleeced by the entrepreneurial locals who are bringing them food and water. The problem is roadworks. (And bad drivers who keep crashing.) It’s always the way. Congestion is always caused by roadworks. As China develops at frightening speeds, it is also incubating a car dependency as frightening as anything the west has to offer. 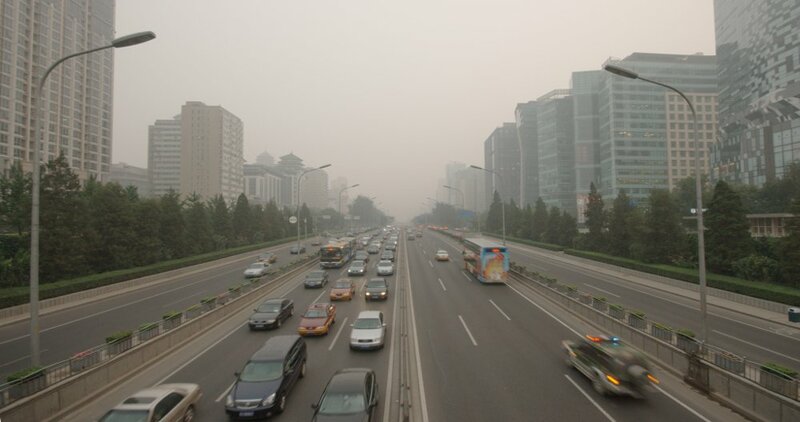 The picture shows Beijing’s second ring road in an unusually calm and free-flowing mood. Confusingly, there is no first ring road — but there is a third, fourth, fifth and sixth, and they’re working on a seventh. The second ring road was built in the 1980s on the old city moat, which surrounded the medieval old city, and which even as late as the 1980s still contained the major part of the city. The closest analogous route in London is the inner ring, which surrounds the congestion charge zone. Being so central, the 2RR has to cope with both through traffic and local traffic, and so it regularly takes vast segregated formations, as seen here at Dongzhimen — with several lanes of through motorway traffic plus more of local traffic, including cycle lanes. There are actually additional lanes of slip road hidden behind the trees there. 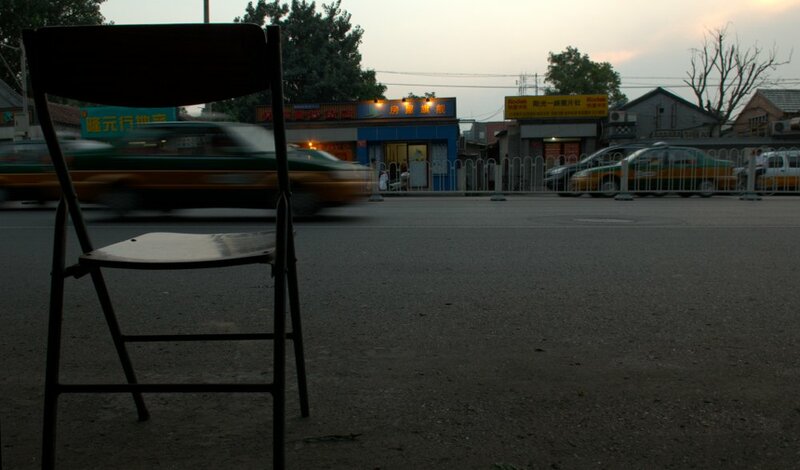 At regular intervals through Beijing’s grid-pattened old town there are great boulevards of a Los Angeles style; three or four lanes of traffic in each direction, with countless brown and yellow striped taxis weaving through the packs of shining black Audis, Toyotas and Range Rovers. These sprawling dual carriageways increasingly squeeze the traditional narrow “Hutong” streets, and even where the Hutongs are not bulldozed to make way for them, the Motorist, in an ever more desperate search for a gap in the traffic or a place to park, is taking over every inch of the city. Beyond the old town, things are even worse. Every building in the first photograph was constructed in the past decade, m’colleagues in Beijing told me. On the right, they stand on the site of the old city walls and former low-rise residential Hutong. On the left, all was fields fifteen years ago, they said. Now the city sprawls for thirty miles and four more ring-roads to the left of the picture; through new prosperous business districts, grand hotels, dense tall housing estates and repetitive suburbia. In the past five years alone, the estimated population of the city grew from 15 million to 22 million; that is, from twice the size of London to three times the size of London. And in the same time, the city gained vast wealth, a hyperactive consumerist attitude, and the gaping rich-poor divide that accompanies those things. And it is now discovering the car and a western Motorist society. The city has about 5 million of them; growing in number by half a million per year. Over the next couple of weeks the blog will look at the effects that Motorism is having on Beijing, and what people are doing about it. This entry was posted in Uncategorized and tagged beijing, car dependency, china, jams, motorways. Bookmark the permalink.